In November I moved to the Atlantic coast of Canada. It's the first time I've lived right at the seaside, but I am originally from the tiny island of Great Britain so never lived too far from the edge. There is a deeply maritime feel to this part of the continent, even in the sheltered Bay of Fundy. The famously macrotidal regime there permeates the culture: artists paint the tidal landscapes; musicians sing about the eerie currents; geologists crawl around on the mud-flats and cliffs. The profound consequences of a 17-metre tidal range and its heartbeat, regular as clockwork. ← Tidal forces shape a bar-built estuary, Pamlico Sound, USA. It's easy to see the effects of the tide in the geological record. Tidal successions are recognizable from some combination of pin-stripe lamination, mud-drapes, bi-directional ripples, proximity to shore, diagnostic fossils, brackish trace fossil assemblages, and other marvellous sedimentological tools. Less intuitively perhaps, at least for a non-biologist like me, marine animals also express these tidal frequencies in their growth patterns. So a coral, for example, might have a lunar breeding cycle. This periodicity results in growth rings just like a tree, only they record not the seasons but the bi-monthly beat of spring and neap tides. The tides are driven by the relative positions of the sun and moon relative to earth. Celestial bodies created banded coral. From Scutton (1963): diurnal rings and and monthly bandsColin Scrutton, one of my professors at the University of Durham in the northeast of England, measured the growth ridges of rugose corals of Middle Devonian successions in Michigan, Ontario and Belgium (Scrutton 1964). He was testing the result of a similar experiment by John Wells (1963). The conclusion: the Devonian year contained 13 lunar months, each lunar month contained 30.6 days, so the year was 399 days long. According to what we know about planetary dynamics in the solar system, the year was approximately the same length so Devonian days were shorter by a couple of hours. The reason: the tides themselves, as they move westward around the eastward-spinning earth, are a simple frictional brake. The earth's rotation slows over time as the earth-moon system loses energy to heat, the ultimate entropy. Even more fascinatingly, the torque exerted by the sun is counteractive, introducing further cyclicities as these signals interfere. Day length, therefore, has probably not slowed monotonically though time. For me, this realization was bound up with an obsession with cyclicity. 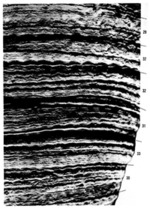 I could not read enough about Milankovitch cycles: wobbles and ellipticity in the earth's dance through space scratching their pulse into the groove of the stratigraphic record and even influencing sea-floor spreading rates, perhaps even mass extinctions. The implications are profound: terametre-scale mechanics of the universe control the timing of cellular neurochemical functions. Why anyone needs astrology to connect with this awesome fact is beyond me. Panella, G, et al (1968). Palaeontological evidence for variation in length of synodic month since late Cambrian. Science 15 (3855), p 792–796, doi: 10.1126/science.162.3855.792. Scrutton, C (1964). Periodicity in Devonian coral growth. Palaeontology 7 (4), p 552–558, pl 86–87. Wells, J (1963). Coral growth and geochronometry. Nature 197, p 948–950. doi: 10.1038/197948a0.